A54-year-old man threw a knife at a woman hitting her in the face, Banbridge Magistrates Court heard last Thursday. Paul Smith, whose address at the date of the offence was given as Old Railway View, Dromore, admitted breach of a non molestation order. This happened between March 23 and March 28 this year at Springfields, Banbridge. The court heard that on March 21 a non molestation order was served on the defendant following a domestic incident with his partner. She received a phone call on that date and recognised it was the defendant before he hung up. She also received an email telling her not to disclose the contents of a letter she later received on March 27. Smith, whose address was given this time as a hostel in Utility Street, Belfast, also admitted assaulting the same injured party on March 18 occasioning her actual bodily harm. A public prosecutor said the victim was asleep when he her daughter, aged 20, came in to tell her that Smith was in the house and he was drunk. The injured party went downstairs and in the living room the defendant was holding a knife to his throat. He threw it at her and hit her on the eye and nose. The daughter was able to force Smith out of the house, locking the door behind him. The prosecutor read from a victim impact statement made by the injured party in which she said she didn’t sleep and had nightmares. A barrister representing Smith said it had been a fairly tumultuous relationship. He added that a psychiatric nurse was now attending the defendant and he was attending AA . The barrister said Smith had no previous convictions and had an impeccable work record. 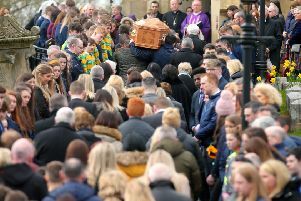 District Judge Eamonn King described it as ‘a very distressing and concerning’ incident and that the defendant should know what an assault can mean given his previous occupation with the ambulance service. Judge King imposed a two year probation order which included several conditions including attending an alcohol counselling programme.